A Fredo is a little chocolate bar with caramel inside. It tastes quite sweet but only costs about 10p, which makes it a good pocket money treat! 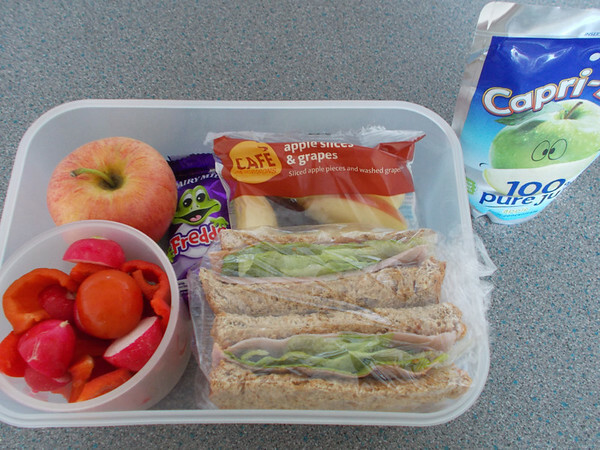 Hi, that's a lot of fruit and veg in your lunch, that's great! I'm trying to figure out what a freddo is? I'm in the US, we do not have them here (at least where I am in GA). I see Dairy Milk on the wrapper, so I'm guessing chocolate? Hello it's Jess here :) Freddos are these little Cadbury chocolate bars, they're just normal milk chocolate, if you ever get a chance you should have one they're delicious! And hehe I guess a little young for coffee but they're scrumptious! Haha I love Harry Potter! :) I would try the Bertie Botts every flavour bean! It seems a healthy lunch :-) I especially like the sandwich! The finger print method is quite interesting method. I have been at schools when we had to put our social security number in and just type in our name. A freddo is a chocolate shaped like a frog. They are probably the equivalent of of about 2 or 3 squares of chocolate so a great treat. Jess, do you pack your own lunches? Or does someone else pack for you? How much say do you have in what is packed -- I mean, do you get to ask for specific items or ingredients? Also, how long do you have for your lunchtime? That is an awesome lunch!! Wow! Impressive! Way to go, stay healthy Jess. :) And the freddo is ok now and then. Just not as an all the time treat. You've done well. Thanks for sharing. Overall, I think that's a pretty healthy lunch. The mom in me is just a tiny bit concerned about the cappuccino because of the amount of caffeine in it that late in the day. But one cappuccino is still a lot better than a lot of kids who drink several sodas (a lot of which also contain a lot of caffeine) in a day, so..... If that's your worst I wouldn't be too concerned about it. But the reason I'm writing this is really to ask you how you feel about those pre-packaged apple slices and grapes? I tried a package of those apple slices once (I live in the US) and I found they had a very pronounced metalic taste. (I took one bite, spat it out, and threw away the rest of the package.) Since you had both those as well as a fresh apple, how did you think the taste of the two differed, or did you really notice a difference? When you consider that a freshly cut apple starts to turn brown quite soon, and even when you rub the cut side with a lemon that still only keeps them from turning brown for a day or so, the fact that those packaged apple slices don't turn brown for weeks makes me really wonder what they're treated with. So, truth to tell, I'd have much preferred if you'd packed two apples, and then perhaps another little cup of grapes. But kuddos to you for getting your crunch from veggies and fruits, and not from empty stuff like crisps. And good on you for being as nutritionally savvy as you are at your age, and realizing that the lunches provided at your school are quite lacking. I agree with you about the prepacked apple slices in the USA tasting weird. I treated myself to a Happy Meal recently and was served prepackaged apple slices for the first time. They tasted as you say - metallic - and I didn't finish the entire package. I only eat fast food once every two or three months these days, so those apples really made me sad. Small West Midlands village? Where abouts? I'm in Bridgnorth! Sounds like an insidious way to get you kids' fingerprints on file. Just another invasion of privacy and a way to permit Big Brother to keep an eye on you guys. Once taken, those fingerprints will probably end up in many systems. Refuse to allow it, parents! Otherwise, this will come back to haunt you in the future! And I wouldn't think one cappuccino is too bad for a nearly grown up. It comes from Italy , where even smaller children consume coffee - latte macchiato mostly; lots of hot milk with an espresso.